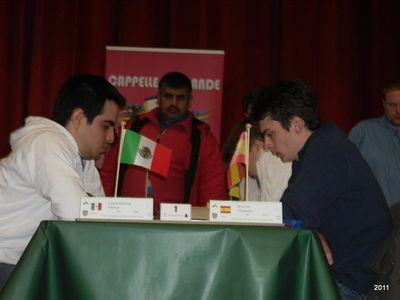 Interview with the GM norm winner and bronze medalist at Cappelle La Grande, Alexander Ipatov. Good afternoon Alexander Ipatov, congratulations on the fantastic performance at Cappelle La Grande and the 2nd GM norm! Thank you Chessdom! To be honest I did not expect such a perfomance before the tournament. My main goal was to show a good level in my games, enjoy the tournament and achieve a GM norm. How does it feel to conquer a medal from one of the largest European opens? I am really very happy and proud of it. I can’t believe that I did it! For sure, Cappelle is the strongest chess open in the world,as every year there are participating about 80 GMs,70 IMs,30 FMs with total participation of 700 players! I use the opportunity to thank the organizers of Cappelle La Grande. The organization was on top level : accommodation, food, chess buses, and most important the attitude to players – all were really great! You defeated GM Zhigalko (2671) and GM Leon Hoyos (2565), drew with Sasikiran (2690), won against GM Cornette (2543) with Black…. Where was the key to such strong performance? I think that the key is clear – deep preparation. I would like to thank my coaches Mr. Efstratios Grivas and Mr. Miodrag Perunovic! They were the basis of this second GM norm. For example, victories against GM Zhigalko (2671) and GM Leon Hoyos (2565) and draw against GM Sasikiran (2690) I achieved thanks to opening analyses of GM Efstratios Grivas. And another component of the game I should not forget – I am very grateful to my mother and father who understand my passion of chess and offer me all the possible conditions to improve and to grow as a person and as a chessplayer. You have been performing at high level regularly – we all know about your success at Moscow Open 2010 (your first GM norm), then a top 10 in the strong Andorra Open, a bronze medal from the Rector Cup, and a gold medal in Copa Catalana. What are your expectations for the summer? This summer I’m going to play many tournaments with the goal to achieve my last GM norm and bring my ELO up to 2600. I have the invitations for Spanish and Turkish Leagues. I am planning to participate in open tournaments in Greece and Spain as well. Right now nothing is fixed, I am still planning my summer calendar. I also hope that invitational closed events will be included in it. With this 2700+ performance you seem in top form. What clubs are you playing for? As I told above, I have the invitation for Turkish League as well. At the moment we are arranging details and I hope to play there too. If we make a Chessdom club you are more than welcome to join! You are also the top junior in Spain and also in top 10 of European strongest U18 players. Specifically for Spain, do you have plans to participate in the national teams in the near future? Of course, it is my dream to play for Spain in Olympiads! 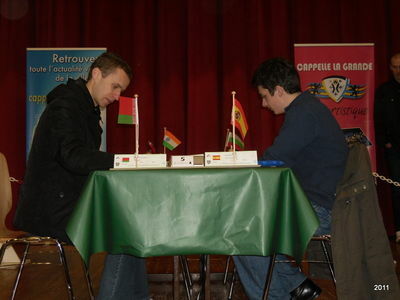 Spanish Chess Federation has great players like GM Alexei Shirov,GM Paco Vallejo and GM Ivan Salgado. 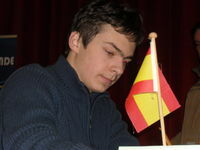 It isdifficult to enter top 5 in Spain, but nothing is impossible – I will be working on chess hardly to achieve it! At the moment it is not known. There are a few options : Thessaloniki open (25th April – 1st May), Polish Ekstraliga (06.05-08.05 for Polonia Wroclaw Club) and Ukranian Team Chess Championship for Law Academy Chess Club (Alushta,12-21.05). Also, very important opportunity was presented to me, I am going to comment the Candidates Matches on Chessdom, an event that will take place in Kazan from 3rd until 27th of May 2011. And also among the activities I will dedicate time to my students. So you also give chess lessons? Yes,I’m working professionally on this field, like a chessplayer, commentator, tutor. I am explaining to my students all aspects of the game of chess : openings (with attached opening analyses), middlegame (general strategy,plans,key ideas,etc), endgames and many outside chess moments which are very important to achieve good results in chess. To be honest I have several very talanted students and I am proud of them.